If you are like many homeowners, you look at your yard each day and wonder what you can do to make it look fuller, greener, or maybe as good as the neighbors. You’ve tried expensive fertilizers and chemicals from the store, but all that they have done is waste your time and your money. You may have even attempted adjusting your yard’s watering schedule, to no avail! It can be discouraging to try so many different things to make your grass grow, only to watch them each fail to deliver the results you expected. Instead, Wellspring Landscape Services has a different, more efficient solution than anything you can buy at the store. 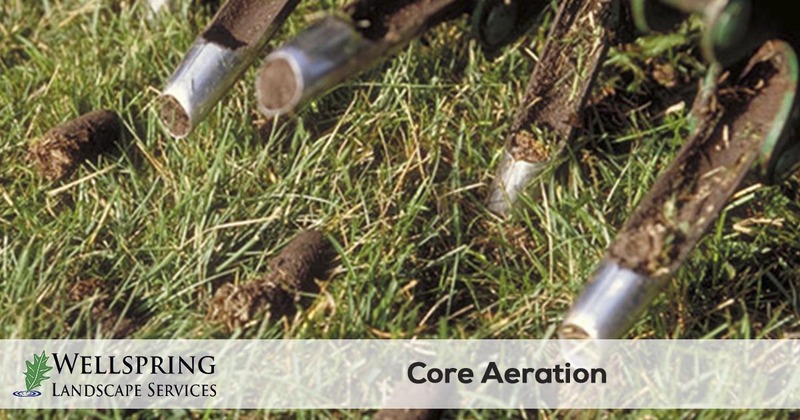 Core aeration, one of our top lawn care services, is among the best ways to promote sustained lawn growth, and improves the lawns ability to uptake nutrients from fertilizers and water. The process is a simple service using our yard core aeration machine. That removes thousands of small plugs of grass and soil from your lawn. But how does removing plugs of grass and dirt help grass grow? One of the most overlooked aspects of grass and other plants is remembering that they, like all living things, require oxygen. Over time, the soil in your yard grows thick, preventing sufficient airflow to travel to the grass’ root system. As a result, the grass becomes stunted, and it may wind up choking it out entirely. By removing natural clods of dirt, rock, and even tangled roots of other plants and grass, it allows your yard to breathe once more. The process is simple, and we’ll have your yard oxygen-rich in no time at all. The core aeration machine works by using a hollow drum, the core, with small puncturing tips along the outside. As it glides across your yard, it removes small plugs of grass, thatch, and soil. It looks much like a walk behind lawn mower used to mow yards. In a short amount of time, your plugs of dirt will have gotten removed, and your yard can finally grow to its full potential! Many homeowners spend a fortune on expensive products and services trying to get their lawn to grow. When all their lawn needed was an annual core aeration service to get the needed oxygen and nutrients to the lawns roots. Core aeration requires no added chemicals and is safe to be done any time of year. Your yard will only benefit from the process, with no adverse side effects! When it is time for your lawns annual core aeration service, you can count on the team at Wellspring Landscape Services to get the job done right. Since 2009, we have been providing the best core aeration services in the Austin, Bee Cave, Lakewood, Rollingwood, and Westlake area. Give us a call today at 512-653-7700 to schedule your service or request a free quote online.